Flowering plum trees, also known as ornamental plum trees, are beautiful trees to plant for shade, for the small edible fruit or for the lovely color of the leaves. They bloom in spring in a burst of tiny pink or white blossoms, reminiscent of Japanese cherry trees. Flowering plum trees also are very popular yard trees. They are hardy from zones 4 to 9, so they will grow in just about any U.S. climate, and they require little care. Choose a spot for your flowering plum tree. It will like full sun, although it can handle partial shade. Test your soil's pH. 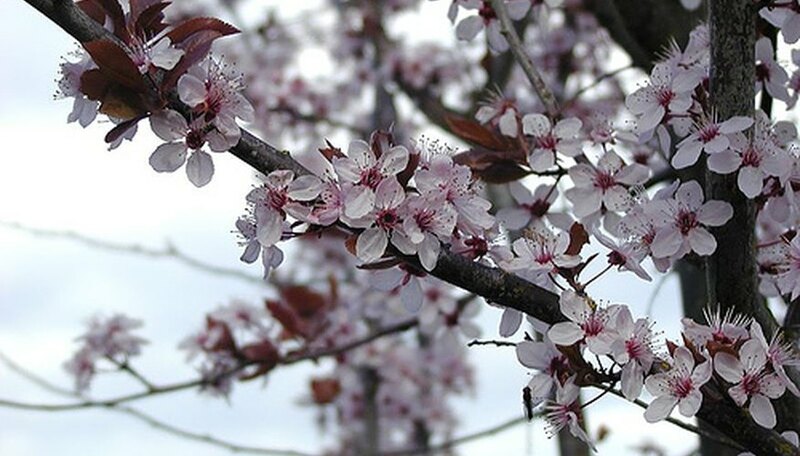 Flowering plum trees can tolerate any type of soil, from loamy to sandy to clay, but they like it slightly acidic. However, flowering plums will grow in alkaline soil. Plant your flowering plum tree in the spring. Dig a hole deep enough to accommodate the root ball, about 3 feet deep, and about 3 feet wide. Place the tree in the hole and cover with soil. Water your flowering plum tree once a week for 10 minutes each watering. In the heat of summer, especially during a dry spell, water twice a week for 10 minutes each watering. When they tree is more than 3 years old, water it once every other week for 10 minutes a watering. Prune your flowering plum tree in the spring, after the blossoms have gone. Remove dead, damaged or crossing branches at the base. The shape should be somewhat globular, so remove any over-reaching branches as well. Leave 6 to 8 inches of room between each branch. Fertilize the flowering plums in the early spring, before they flower, with compost, manure or 2 cups of water soluble 10-10-10. Spread the fertilizer around the base of the tree. Flowering plum trees are drought resistant. Black knot can stunt the growth of flowering plum trees, but it can be controlled with a lime-sulfur fungicide and by removing the black knots.